"...Your Landscape Architect Mr. Lambert" is the text of interest here. See more below. This excerpt comes from a letter addressed to Garden founder A.J. Hodges upon his recent visit with the F. Graham Williams Company. Credit: Hodges Foundation archive. 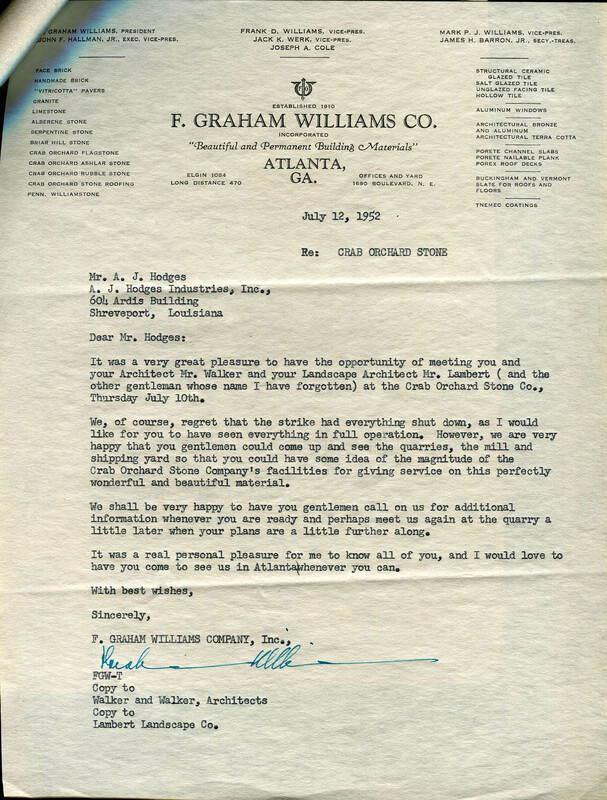 This letter from F. Graham Williams Company to A.J. Hodges is the source from which the above text detail was excerpted. After visiting a Crab Orchard Stone Company quarry with the above mentioned building supply dealer, Hodges is thanked in this letter. The first paragraph mentions a landscape architect from the Lambert Landscape Company. Though a number of designed features at Hodges Gardens are credited to Hare & Hare Landscape Architects, this is the first I have seen of Lambert's association. Could a Lambert landscape architect be responsible for some un-credited drawings of which I have discovered? Earlier this summer I spent several hours discovering, uncovering, skimming, and scanning/photographing various archival materials–including original correspondence letters, drawings, sketches, advertisements, photographs, and other publications. These resources revealed many clues about the history of the Hodges Gardens landscape, including its initial development and evolution over time. Though state park officials informed me of the architects early on, mid-summer research unveiled that Hare & Hare of Kansas City were the landscape architects that contributed to Hodges Gardens design. I am aware of a few more than twenty (20) Hare & Hare drawings, each of which were likely prepared or approved by Mr. Donald Bush (ASLA Fellow; park planning and estate planning specialist at the firm), the landscape architect hired by Hodges and a principal at the firm. However, there are almost as many drawings proposing items like vegetation beds, walkways, and water courses–all of which fail to credit the designer. This has been a mystery with little to no leads until YESTERDAY… (I will take another drink of coffee as I hold myself back from linking that all-caps word to the Beatles song video of that title). As mentioned above, I have uncovered several archival materials, but time has not permitted a thorough review of all items. In reviewing a letter yesterday, I came across some words of excitement: “your landscape architect Mr. Lambert.” Whoa. Excerpted from the images above, this is a letter in which a Crab Orchard sandstone dealer writes Garden founder A.J. Hodges and also thanks his architect and landscape architect. Again, this is the first I have heard of a Lambert Landscape Company’s association with Hodges Gardens. A quick internet search brought me to Lambert’s website, which represents this firm which is operating in Dallas, Texas. Focused on garden design, the group was established in 1919. A brief history paragraph on the firm’s website notes that Joe and Henry Lambert brought the company from Shreveport to Dallas in 1935, which even more closely roots the firm in this northwest Louisiana area. Perhaps Lambert’s is responsible for the un-credited drawings or even design elements of which I have yet to locate drawn proposals? If so, what was the extent, if any, of Lambert’s relationship with Hare & Hare? These are new, exciting questions. I sent Lambert’s an email yesterday afternoon. I’ll keep you posted. Our archives do not go back to 1952 though it is very conceivable that we worked on the gardens. Please feel free to email me at lmoffat@lamberts.net. Great site. Thanks for showing us….